Comments: The outstanding Rebel Pilot from the planet Sullust, Nien Nunb served as Lando Calrissian's copilot in the Millennium Falcon during the Battle of Endor. 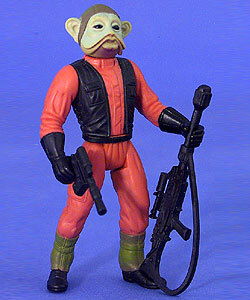 Nien Nunb was actually a puppet controlled by a puppeteer underneath the control panel, just off-camera. This figure has similarly sculpted limbs as his fellow Sullustan, Ten Numb from the Rebel Pilots cinema scene.